DriTac 6200 Premium Pressure Sensitive Wood Flooring Adhesive is the product of choice for professional wood and cork flooring installations. After years of successful use, flooring contractors, installers, and architects continue to find DriTac 6200 Premium Pressure Sensitive Wood Flooring Adhesive has the superior tack, excellent bond strength and long open time ideally suited to commercial, residential and institutional applications. DriTac 9100 Contractors Choice High Solids Wood Flooring Adhesive is a Polymeric Resin that has been formulated for wet-lay installations. DriTac 9100 Contractors Choice is a professional grade adhesive that spreads easily and cleans up with a damp rag. Installers must lay wood into the adhesive immediately after troweling the adhesive. DriTac 9100 Contractors Choice has low VOC content, is fast grabbing and low in odor. Easy Spread DriTac 7400 was specially formulated to be very easy to spread. It is also easy to clean up when wet. 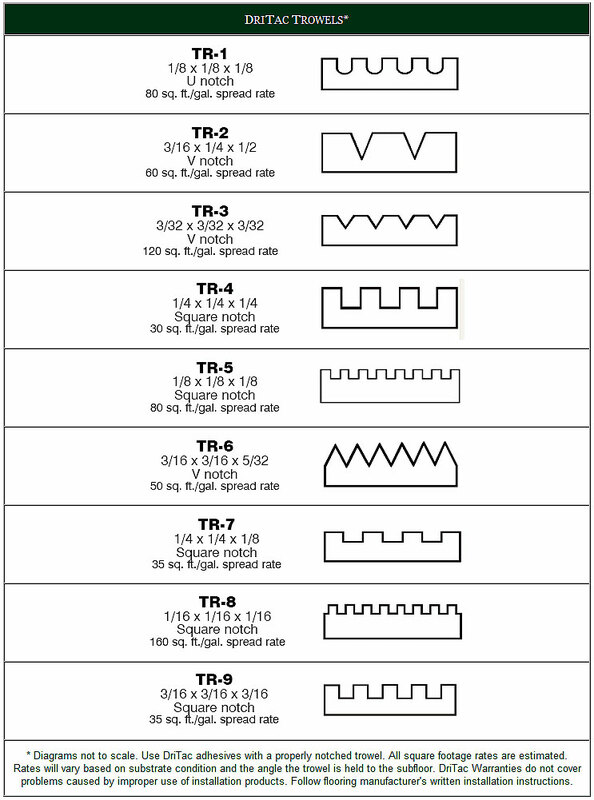 Easy Spread is less fatiguing to trowel and allows installers to increase their productivity. Easy Spread DriTac 7400 is easier to remove from the pail, spread onto the subfloor and faster to apply. Easy Spread is non-slumping, low in odor and provides a high initial tack and permanent bond. DriTac 7600 is the most advanced premium urethane wood flooring adhesive. DriTac 7600 Premium Urethane Adhesive provides high initial tack, low odor and excellent permanent adhesion. DriTac 7600 Urethane adhesive is VOC compliant, easy to trowel, provides superior coverage and has excellent ridging. It is recommended by installers for both residential and commercial installations. DriTac Eco-6200GR "Green" Pressure Sensitive Wood Flooring Adhesive is the product of choice for "green" professional wood and cork flooring installations. DriTac Eco-6200GR "Green" Pressure Sensitive contains zero VOCs and zero solvents and spreads very easily. DriTac Eco-6200GR "Green" Pressure Sensitive Adhesive has the superior tack, excellent bond strength and long open time ideally suited for commercial, residential and institutional applications. DriTac 9200 FasTac High Solids Wood Flooring Adhesive is a Polymeric Resin with Urethane that has been specially formulated for wet-lay installations. DriTac 9200 FasTac is a professional grade adhesive that spreads easily and inhibits the growth of bacteria and mold. Installers must lay wood into the adhesive immediately after troweling the adhesive. DriTac 9200 FasTac is solvent free, VOC free, fast grabbing and low in odor. DriTac 7500 Eco-Urethane is solvent free with zero VOCs and is recommended as the adhesive of choice for all “green” projects. DriTac 7500 Eco-Urethane has a high initial tack, contains no water and provides a permanent bond. DriTac 7500 Eco-Urethane provides superior coverage, is freeze-thaw stable, non-slumping, very low in odor and remains elastomeric allowing for normal expansion and contraction of wood flooring. DriTac MCS 7000 Concrete Moisture Control System reduces the transmission rate of moisture vapor within any concrete subfloor (up to 12 lbs) to levels accepted by most wood flooring manufacturers. The DriTac System consists of a two component epoxy, which is mixed together to form a coating that is applied to the surface of the concrete subfloor. When used in conjunction with DriTac 7600, DriTac 7500 Eco-Urethane or Easy Spread DriTac 7400 Urethane Adhesives, DriTac MCS 7000 Concrete Moisture Control System is fully- warranted. It dries quickly and has low odor. DriTac MCS 7000 also helps reduce the potential for mold and mildew growth caused by subfloor moisture. DriTac 8000 Moisture Guard Concrete Moisture Barrier and Crack Suppressant reduces the transmission rate of moisture vapor within any concrete subfloor (up to 12 lbs) to levels accepted by most wood flooring manufacturers. DriTac 8000 Moisture Guard is a one-component trowelable moisture cure urethane membrane, which forms a a smooth protective membrane on concrete subfloors and significantly reduces moisture vapor transmission from affecting engineered hardwood flooring installations. When used in conjunction with DriTac 7600, DriTac 7500 Eco-Urethane or Easy Spread DriTac 7400 Urethane Adhesives, DriTac 8000 Moisture Guard is fully-warranted. DriTac Liquid Urethane Adhesive Remover removes wet or uncured urethane adhesive from wood flooring surfaces. DriTac’s Urethane Adhesive Remover is also recommended for removing urethane adhesive from tools used in the installation of wood flooring. DriTac Urethane Adhesive Removers is specially formulated to be the most effective and efficient remover available. DriTac Wipe-Aways "Green" Urethane Adhesive Remover removes wet or uncured urethane adhesive from wood flooring surfaces. DriTac Wipe-Aways "Green" Urethane Adhesive Remover contains zero VOCs and Zero solvents. DriTac Wipe-Aways "Green" Urethane Adhesive Remover is easy to use, water rinseable, biodegradeable and provides no harm to the finish of the wood flooring. 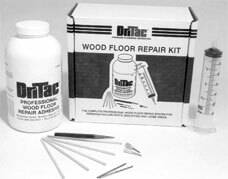 DriTac has developed a repair system to correct the hollow spots and popping conditions for engineered wood flooring installations when other adhesives fail to get the job done. These defects cost the flooring industry millions of dollars per year. Studies and experience show that a major cause of these problems for engineered wood floor installations are adhesive voids between the flooring and the subfloor.